Recent foreign policy moves by India at SCO Summit indicate an inflexion point. Combining orthodox ideas from the Cold War era along with 21st century pragmatism, it appears that India has decided that the emerging multipolar world is becoming far too complicated for the binary choices. First, the central theme was that at a time when the world is facing power shifts, uncertainty and competition over geopolitical ideas and political models, India would project itself as an independent power and actor across Asia. One of the most important parts of the speech was when PM described India’s ties with the three great powers. Russia and the United States were called as partners with whom India has relationships based on overlapping interests in international and Asian geopolitics. And, India-China relations were portrayed in complex terms as having “many layers” but with a positive undertone, that stability in that relationship is important for India and the world. This implies that India will not be part of a closed group of nations or aggregate Indian power in a bloc, but will chart out its own course based on its own capacity and ideas. When nations stand on the side of principles, not behind one power or the other, they earn the respect of the world and a voice in international affairs. For some, this portends a renewed emphasis on non-alignment. The PM himself used the more agreeable term “strategic autonomy”. In essence, it means that India has become too big to be part of any political-military camp whose design and role in Asian affairs are being conceived elsewhere, upon ideas that India might not fully share, and where India has a marginal role in strategy and policy implementation. Our PM removed any lingering impression of an impeding crusade or an ideological sub-text to India’s Act East policy in the coming years when he remarked. India does not see the Indo-Pacific Region as a strategy or as a club of limited members. Without mentioning either, PM urged both the U.S. and China to manage their rivalry and prevent their “normal” competition from descending into conflict. He made it clear that while India would pursue many partnerships “in the region and beyond”, it was not going to choose “one side of a divide or the other” but would remain wedded to its principles and values that emphasise inclusiveness, diversity and of course its own interests. The theme includes “counter-terrorism in semi-urban terrain and cordon and search”, and each side will bring in some 30 soldiers. The conclave of Army chiefs is scheduled on the last two days of the exercise. The chiefs will debate the challenge of terrorism and transnational crime, which is a major concern among all the states and on how they can promote collective cooperation. 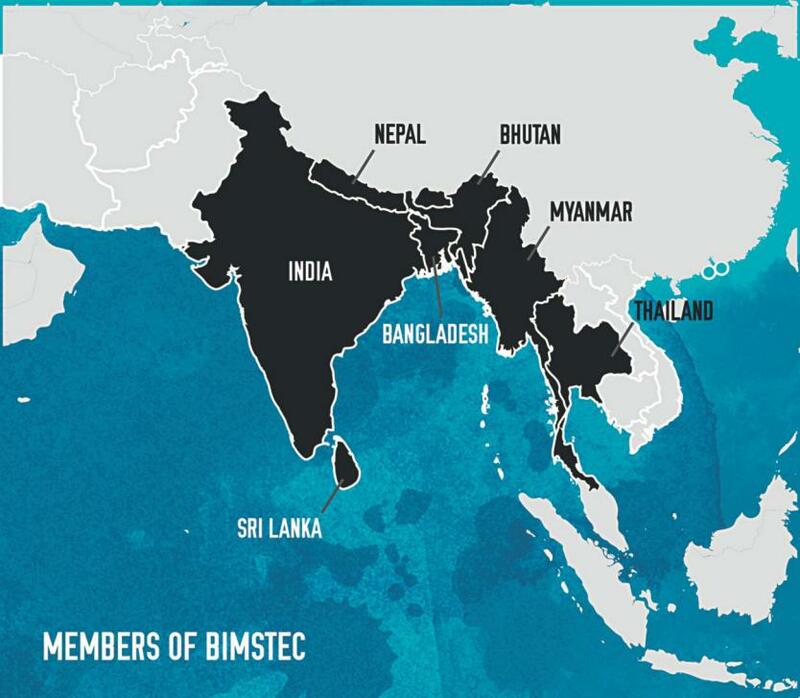 The Bay of Bengal Initiative for Multi-Sectoral Technical and Economic Cooperation (BIMSTEC) is a regional organization comprising seven Member States lying in thelittoral and adjacent areas of the Bay of Bengal constituting a contiguous regional unity. This sub-regional organization came into being on 6 June 1997 through the Bangkok Declaration. The regional group constitutes a bridge between South and South East Asia and represents a reinforcement of relations among these countries. BIMSTEC has also established a platform for intra-regional cooperation between SAARC and ASEAN members. After initial hiccups in implementing the maternity benefit programme Pradhan Mantri Matru Vandana Yojana (PMMVY), the government has finally made some headway and provided cash incentives to nearly 23.6 lakh beneficiaries out of an estimated 51.6 lakh a year. However, until January 2018, the government programme had covered only 90,000 women — a mere 2% of the target. However, due to a huge backlog from last year, the government needed to provide cash benefits to over 100 lakh estimated beneficiaries by the end of the financial year 2017-18. Many States like Tamil Nadu, Telangana, Odisha and West Bengal have not yet come on board to implement the scheme. But they were bound to comply because the scheme was a by-product of the National Food Security Act. The maternity benefits under PMMVY are available to all Pregnant Women & Lactating Mothers (PW&LM) except those in regular employment with the Central Government or State Government or Public Sector Undertaking or those who are in receipt of similar benefits under any law. It is for first living child of the family as normally the first pregnancy of a woman exposes her to new kind of challenges and stress factors. The cash incentives provided would lead to improved health seeking behaviour amongst the PW&LM. However, to address the problem of malnutrition and morbidity among children, the Anganwadi Services Scheme, which is universal, is available to all PW&LM including the second pregnancy. Further, in order to address the malnutrition and morbidity during pregnancies a number of interventions are provided to the pregnant women viz. universal screening of pregnant women for Anaemia and Iron and Folic Acid (IFA) supplementation, Calcium supplementation in pregnancy, Deworming in pregnancy, Weight gain monitoring and Counselling on nutrition, family planning and prevention of diseases. The NITI Aayog has published an ambitious discussion paper on kickstarting the artificial intelligence (AI) ecosystem in India. To pull this off, India would have to develop AI tools for a range of applications: reading cancer pathology reports, rerouting traffic in smart cities, telling farmers where to store their produce, and picking students at high risk of dropping out from school, among them. It is a tall order, but several countries have similar ambitions. The U.S., Japan and China have published their AI strategy documents and, importantly, put their money where their aspirations are. China, for example, plans to hand out a million dollars in subsidies to AI firms, as well as to run a five-year university programme for 500 teachers and 5,000 students. These are lofty goals, but they beg the question: can India bring it to pass? In answer, the NITI Aayog offers a sombre note of caution. India hardly has any AI expertise today. The paper estimates that it has around 50 top-notch AI researchers, concentrated in elite institutions like the IITs. India’s H-index, a measure of how often its papers are cited, is behind 18 other countries. This is not encouraging, considering that returns on AI are not guaranteed. The technology has tripped up as often as it has delivered. Among successes, a recent study found that a Google neural network correctly identified cancerous skin lesions more often than expert dermatologists did. India, with its acute shortage of specialist doctors in rural areas, could benefit greatly from such a tool. studies have found that AI image-recognition technologies do badly at identifying some races, because the data used to train them over-represent other races. This highlights the importance of quality data in building smart AI tools. India lacks this in sectors such as agriculture and health. Where data exist, this is poorly annotated, making it unusable by AI systems. Despite these formidable challenges, the scope of NITI Aayog’s paper must be lauded. The trick will be to follow it up with action, which will demand a strong buy-in from policymakers and substantial funds. Bringing in private sector talent can buttress the bureaucracy but far-reaching reforms are needed to revitalize it.